Only five more days til the Sustainable Suite Design Competition’s application deadline. Sponsored by three industry powerhouses: USGBC, ASID and NEWH, it was developed to help drive green design practices within the hotel industry. This competition provides a platform for student and professional teams from around the world to present their approach to green hotel room interior design. Entries are due by August 31, 2009, and judging will be completed by October 1, 2009. The winning design will be built as a model guest room to be presented as an educational display for the design industry, hotel owners and brands, and corporate travel executives. Additionally the winning team and design will be profiled in Hospitality Design, ASID ICON, and the NEWH Magazine. The winning design team must commit to producing construction documents within six-weeks of award notification for model room fabrication. 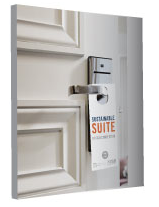 The Sustainable Suite will be unveiled at HDExpo in Las Vegas, NV in May 2010. Click here for more info and to download an application.